These beautiful velvety morcels in their pearlescent shells are so easy to cook, but most go for the vacuum packed tasteless ones. Here’s a few tips to make it a little more straight forward. First and foremost choose fresh, living mussels and consume on the day of purchase, these critters don’t like hanging about. Rinse them through under a cold tap and make sure they are all closed. If any are open give them a little tap, if they don’t start to close then discard them. some mussels will have beards, you need to tear these off before cooking. a good half bottle of dry white wine. Melt your butter in a heavy bottom pan along with the shallots, do not let the butter burn, 2 minutes on a medium heat is fine. Once the shallots are translucent add the wine and bring to the boil. Season. Please only use wine that you would normally drink and enjoy, this is really important here. Throw all the mussels in the pot and cover with the lid. 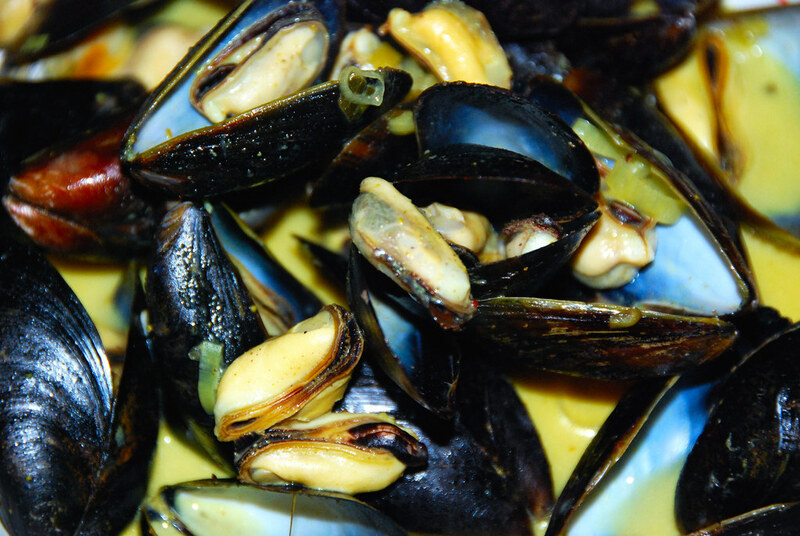 Cook the mussels until they are all open, usually about 6 to 8 minutes, add another generous knob of butter and some chopped parsley and give the pan a good shake. Jiggle them into a nice serving dish. Have some nice crusty bread for mopping up the juices! 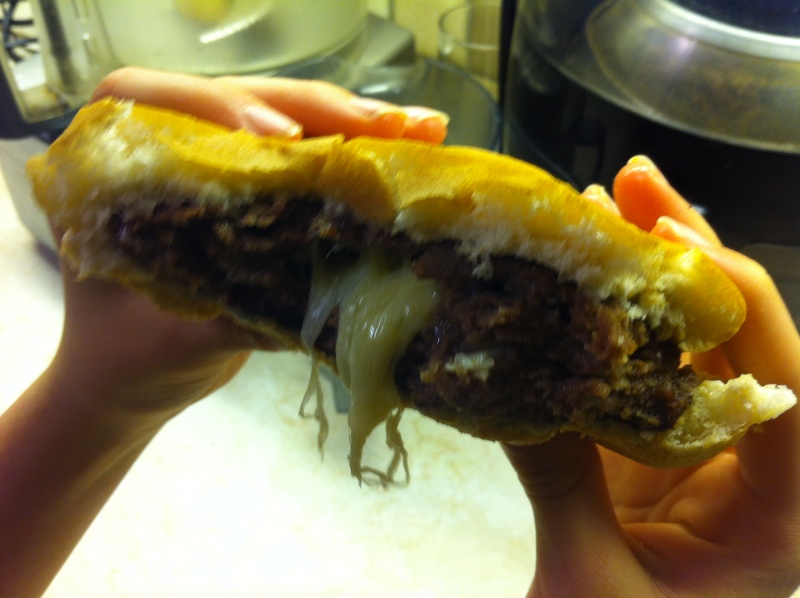 Jucy Lucy or Juicy Lucy is a cheeseburger with a difference. Instead of having the cheese on top of the patty, you split the patty and put the cheese inside then crimp the patty closed again with your fingers. If the patties are thin enough you can use two and crimp together. The patty is then cooked melting the cheese inside. A word of warning, the cheese gets very hot and splurges out on the bite so proceed with caution. The JL originates from South Minneapolis where two Diners claim to have invented the Sandwich, Matt’s Bar and the 5-8 Club who are serious rivals. The variants are endless different cheeses and different toppings, At TGFC HQ we like it with Smoked Cheese. Can anything satisfy a family better than a Chicken in the oven with the smells permeating through every room in the house? Don’t be put off by the amount of garlic, it really isn’t that strong, just exceedingly delicious. Peel all the garlic cloves and place in a pan of hot water and simmer for 30 minutes, then remove with a slotted spoon and reserve the water. Heat your oven to 180c. 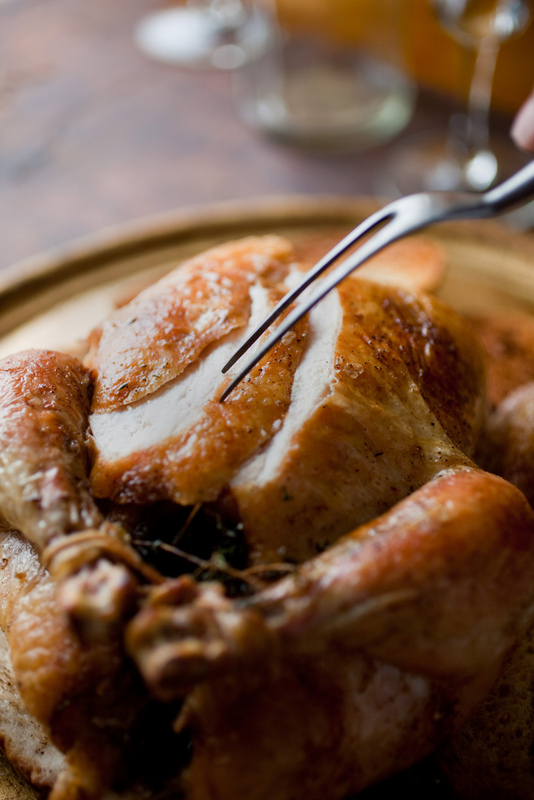 Stuff your bird with slices of lemon, rosemary sprigs and the cloves of garlic. Season. Cook your chicken according to its weight, when it is ready remove to a chopping board and cover with foil to keep warm. Now place the cooking pan on direct heat and deglaze with the white wine to remove all the fond (chefy speak for sticky, crispy, burny bits stuck to the pan) then add the the garlic liquor. When warmed through add the sauce back to the flour 1 tablespoon at a time to produce a roux type mix then add this back to the sauce. If it’s a little lumpy give it a quick blast with a hand held mixer. Add parsley to you sauce and serve with your Chook.